It has been a while since my last dryland mistake post, but I’ve had many thoughts on poor dryland exercises over the past year. The reason for my absence in these posts was the negative connotations from the title. 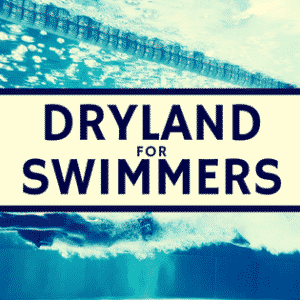 Nonetheless, the overall theme of this post is a larger point as dryland in swimming contains more problems than imaginable. I discussed many of these problems in an article discussing Crossfit for swimmers. This article was meant to not just discuss Crossfit, but pitfalls in many swimming dryland programs. However, this piece resulted in my first cease and desist letter…this was the first time I realized people actually read my blog posts! Perhaps I didn’t preface that article enough, but remember all exercises can be used safely and properly for the correct person, biomechanics, volume, and programming. For example, although John Matulevich have wrote harsh words against the swim bench, the swim bench can still benefit the right person. For example, perhaps you can’t swim because you don’t have pool access. Then, the swim bench may provide the closest representation to stroking (although I’d argue it is still far from the actual biomechanics), perhaps the swim bench provides benefit. Another example is for someone unfamiliar with an early vertical forearm, perhaps the swim bench can encourage the early vertical forearm and help a swimmer understand the correct form which may translate into the pool. I know there are a lot of passive terms like may or could, but that is a lot of coaching, you provide a correction or use a tool for learning the correction and see if it works. Some tools work more often than others, but every tool has an application before. 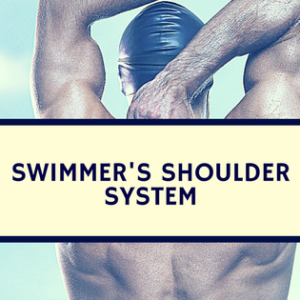 Shoulder Injury Risk: The largest contributor for shoulder injury in swimming is overuse. 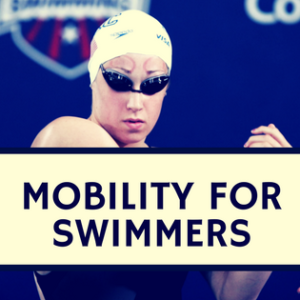 Now, the research hasn’t identified how intensity plays into the equation of overuse, but swimmers already use their arms excessively, especially with internal rotation. Therefore, mimicking this motion on land (in a potentially unsafe low back/mid-back position, see below) only increase the risk of overuse injury. I released the swimmer’s shoulder system almost 4 years ago and have helped many learn about shoulder injuries and prevention, but the injury rate is still high, estimated at 60%. Now, this only classifies actual injuries, not the common “shoulder pain” which is unfortunately universally accepted in swimming. 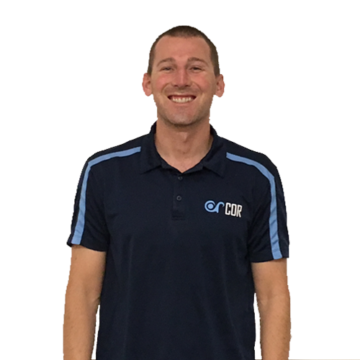 If you haven’t read this great interview with Dr. Wymore on subjective pain ratings in swimmers, check it out. In short, his research suggests “healthy, non-injured” swimmers have more pain than baseball pitchers recovering from an injury! In my opinion, this occurs from a skewed opinion of injuries/pain in swimmers. Think of how many teams accept shoulder pain or feel shoulder pain is a perquisite for swimmers [sorry for the plug, but if you haven’t joined our newsletter, we are revamping it at the moment, but will make up for our infrequency of newsletters, a 30 minute lecture on NIMPS is coming, stay tuned). This myth is extremely flawed and stems from not understanding the difference between pain and soreness. Also, poor form (which often happens when this exercise is accompanied with poor volume, see #3) encourages poor scapular control, likely perpetuating shoulder instability. Think of all the swimmers who rush through this exercise, letting their shoulder blades slide and glide up their body with no control. This poor form creates an unstable foundation for the arm to move, further perpetuating an issue that already exists in swimmers…scary!Improved education for coaches, swimmers, and parents on how to differentiate pain and injury is necessary, hopefully this website and our writings are helping! Nonetheless, this exercise likely perpetuates shoulder injuries. Low Back Injury Risk: Unlike the shoulders, lower back injury risk during this exercise could be lower and should be close to nonexistent, if the exercise is performed correctly (if performed correctly, a hip hinge allows the swimmer to bend from the hips, greatly reducing stress on the lumbar spine). Unfortunately, the band bent-over row is often performed with poor biomechanics at the lumbar spine. This is due to poor coaching and simply assuming this is a “simple” or “easy” exercise. Unfortunately, flexing the spine and standing in an awful posture only contributes to the typical swimmer’s posture which further increases the risk of shoulder injury. Once again, this injury risk isn’t as bad as the shoulder, but when a poor set-up posture is combined with an excessive exercise volume (see below) you have an increase in low back stress, which perpetuates the low back injury risk and damage, which already occurs in swimmers (if you weren’t familiar, swimmers have a higher risk of disc degeneration than other athletes, also checkout 7 ways to reduce low back pain in swimming). 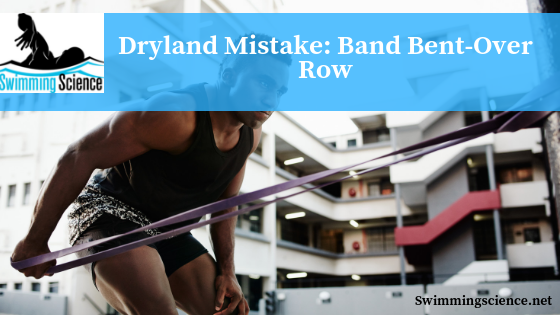 When the band bent-over row is combined with poor low back position, it creates a more hazardous position than the swim bench, combing a low back and shoulder injury risk. Excessive Repetitions: I’ve written about dryland flaws previously, but one of the major flaws is excessive exercise volume (see 3 coretraining mistakes). Now, this doesn’t suggest high repetitions are always a problem, but it isn’t often what is best for swimmers. If you’re interested in more explanation about why low volume, high-intensity swimming, resistance training is ideal. Now, not only will excessive repetitions further stress the muscle fibers many traditional training programs have already stressed (simply burning the candle from both ends), but it facilitates the first two points! Even if you can safely hip hinge and perform the exercise without placing high stress on the low back, it is extremely unlikely to perform a safe hip hinge when performing this exercise for more than 15 repetitions. Yet, it isn’t uncommon for a team to perform this exercise for :60 or longer! Once again, excessive repetitions facilitate poor form, which increases injury risk. 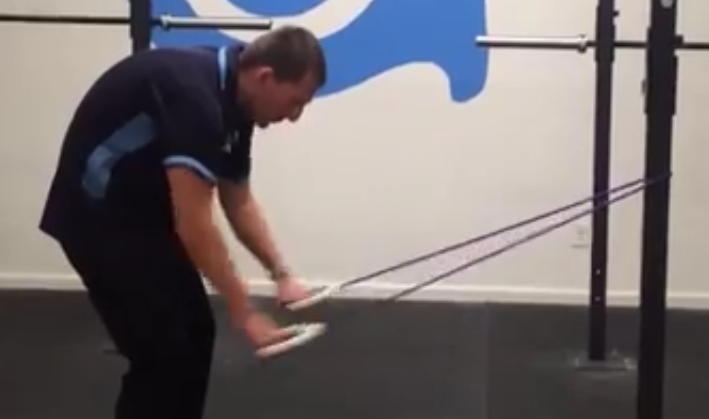 Once again, the band bent-over row can be done safely, yet this rarely occurs. Moreover, how many more shoulder internal rotations do we really think will strengthen the shoulder? Is performing a million a year not enough to strengthen it? If not, perhaps the swimming programming needs assessment. Nonetheless, if you are performing the band bent-over row, use it sparingly and perform it safely, for reduced shoulder and low back pain, as well as greater dryland transfers!